Written and directed by Ike Barinholtz, The Oath is a satirical political comedy that hits a bit too close to home, while also managing to go over-the-top in its spectacle. The United States government has put into place the “loyalty oath” for the population to sign. It becomes a major point of contention for the country. If you sign it, you get “perks” and if you don’t… well, you could be taken away by the newly created Citizens Protection Unit (CPU) and never be heard from or seen again. The government claims you won’t necessarily be penalized for not signing, but the implication is that you’re not a patriot if you don’t. Sounds very familiar in our current political climate where taking a knee is simultaneously practicing your right to protest while, for others, it’s considered disrespectful to the flag. It’s a bit ridiculous that in a democracy, practicing a right–in the movie’s case the choice to not sign–would be considered downright treacherous, but the divide is there and the tension is heightened and it’s on par with the world we live in. The loyalty oath easily works as background noise and is also at the forefront of the film. 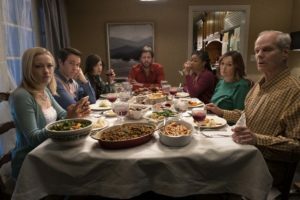 With that setup, enter Chris (Ike Barinholtz), a seemingly well-off man living with his wife, Kai (Tiffany Haddish) and their daughter in the suburbs of somewhere. Chris is always irate about the news, but there’s an addiction to it as well. He wants to constantly be in the know, even if it drives up his blood pressure and tests the patience of his family. His views don’t exactly coincide with the ideas of his family, which includes his brother, Pat (Jon Barinholtz), mother and father (Nora Dunn and Chris Ellis), and Pat’s girlfriend, Abbie (Meredith Hagner). The only person he gets along with in his family is his sister, Alice (Carrie Brownstein). But as the deadline to sign the loyalty oath approaches, which is right around Thanksgiving, it becomes harder and harder to not discuss politics at the family dinner. During the first 45 minutes or so, The Oath does a really good job building the tension within the family and also letting us bear witness to the tension in the general community. An example is when Chris’ family is out at a restaurant and an older man starts going off on a group of 20-somethings discussing the loyalty oath and how it should be ok to not want to sign. The story remains intimate and contained within the walls of the family home, but as it inches towards the final act, the tension becomes so thick it can be cut with a knife. Throughout the film, Tiffany Haddish’s Kai is the one who attempts to keep the peace between Chris and his family. She’s often calming him down and tells him to avoid talking politics at the table so that they can have a nice holiday week without anyone getting heated over opposing opinions. It gets to the point where Chris begins to ask her that, as a black woman, how can she not be bothered by Abbie and Pat’s overtly insensitive opinions? She shuts down the conversation before it really gets started. It isn’t until later when we realize why she doesn’t discuss it. At the same time, it’s a missed opportunity to give Kai more of a voice. She is a black woman surrounded by a white family, we never get to see hers, and she lives in a neighborhood filled with mostly white people. To downplay her role and voice in the film is a detriment to the story. The Oath works as a political satire for some of the film. It parallels real life enough that it hits the right notes while also being in a world all its own. Honestly one of the most realistic aspects of the films is the familial confrontations, the jabs, the feeling of wanting to scream at a relative because their opinions greatly differ. It’s because these opinions, which Pat argues can’t be wrong because they’re opinions (which… ok, Pat), are so much a part of the political dissent that’s helped to taint relationships. So it’s the part of the film that’s especially done well. On the other hand, the biggest issues with the film begin when the CPU agents, Mason (Billy Magnussen) and Peter (John Cho), arrive to question Chris the day after Thanksgiving, AKA the final day for citizens to sign the loyalty oath. The thriller part of the story works for a short while before being dragged out for an unnecessarily long time. Beyond that, The Oath tries to play the all sides argument half of the way through, but it’s hard to take seriously when certain family members are acting the way they are. 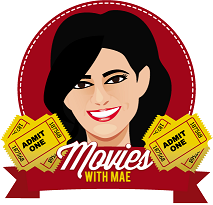 It doesn’t really want to take a firm stand, even though its main character certainly does for the better half of the film. Fear is used as an excuse with regards to the choices made. At the same time, this fear coming from members of a white middle-upper class family isn’t exactly justified and makes them look all the more problematic. The Oath is solid for the first half hour before it begins to show its cracks. It plays well into the familial drama that can happen over opposing political views, but its insistence on becoming more of a thriller later only gives it so much momentum before quickly running out of fuel. The Oath plays well into the familial drama that can happen over opposing political views, but its insistence on becoming more of a thriller later only gives it so much momentum before quickly running out of fuel.